The year is 1930 and in the Royal Infirmary Hospital in Sheffield, UK, for the first time a patient has had their bacterial infection cured by antibiotics. Cecil George Paine has used penicillin to treat an infant suffering from neonatal conjunctivitis. Since its discovery by Alexander Fleming almost 90 years ago, Penicillin is still used to treat illnesses. Our access to antibiotics like penicillin has changed the world, and allowed humanity to overcome bacterial infections. However, this golden era may be coming to an end. Bacteria are starting to show resistance, meaning they are immune to some antibiotics. Just this week a woman in America died from a bacterial infection resistant to all known antibiotics. If antibiotics are no longer effective, are we set to return to a pre-1930s world where every infection could carry a death sentence? Before we can answer that question, we need to describe just what antibiotic resistance is. Antibiotics are chemicals (strings of atoms arranged in a particular fashion) which kill bacterial cells whilst leaving human cells unscathed. When we have a bacterial infection, we take antibiotics to kill the microbial invaders and leave us unharmed. One bacterium is made from a single cell, whereas you and I are built from billions, and the cells we are made from are structured very differently. t. Antibiotics target parts of bacteria that either human cells do not have (bacteria have cell walls which human cells lack) or parts that both cells have but are structured differently. 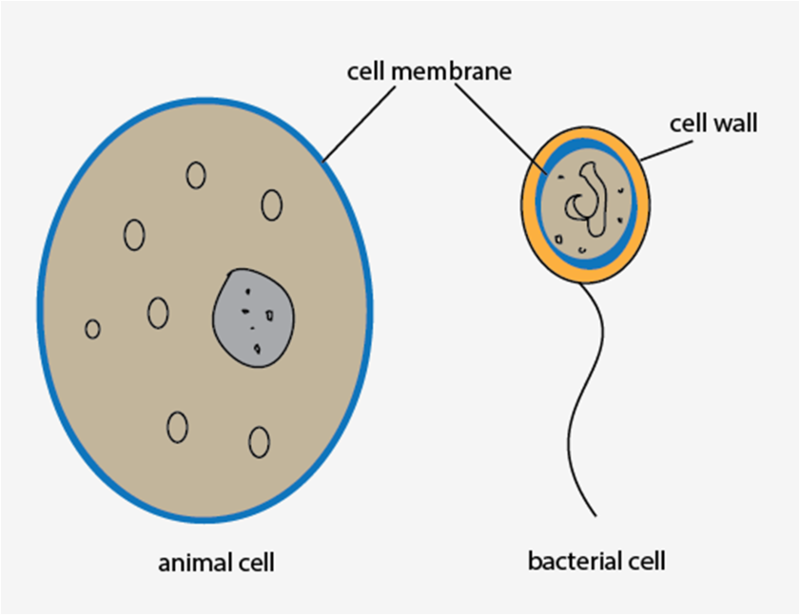 Humans and bacteria have their cell fenced off by the cell membrane (below the cell wall in bacteria) but they are sufficiently different that an antibiotic that pierces a bacterial membrane bounces off the human equivalent. Antibiotics employ five main methods to maim bacteria. First, they tear through the cell wall causing bacteria to burst. Secondly, they can punch through the cell membrane causing the bacterial innards to leak out. Thirdly, they stop bacteria from making new DNA; preventing reproduction. Fourthly they starve the bacteria by blocking production of key nutrients like Folic Acid. 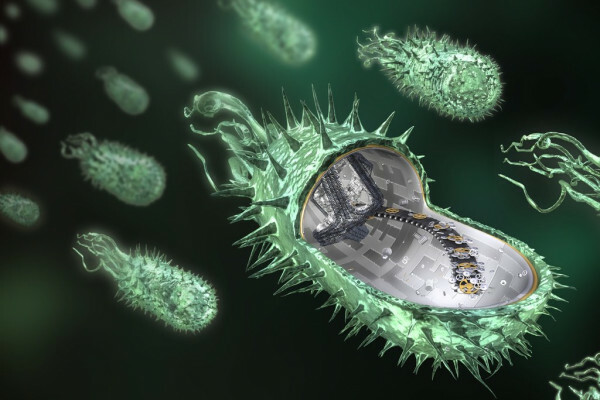 Finally, they jam a bacteria’s protein factory and without new proteins the bacteria cannot survive. Bacteria, however, are able to develop strategies to avoid antibiotic assassination. Bacteria can escape destruction in a number of ways. Bacteria can pre-emptively sabotage the antibiotic by cutting it to pieces. Bacteria can also avoid detection by disguising themselves. Antibiotics target a precise component of the bacterial cell; a lock which exactly matches their deadly key. However, bacteria can subtly alter the shape of this lock so the key cannot fit, thus rendering it useless. For most antibiotics to work they have to first get inside the bacteria: they must pass through the cell wall and cell membrane. Some bacteria change their membrane so it acts like chemical waterproofing and the antibiotic cannot penetrate it. Resistance mechanisms are produced by changes to the bacteria’s DNA. DNA is a set of instructions which tell a cell, human or bacterial, what proteins to make. Each protein is a machine which accomplishes a task. For instance the protein Aquaporin is a tunnel that allows water to get into a cell. These instructions are written in a language of four letters, A, T, G and C.
When cells divide they produce two copies of the DNA so both cells have the instructions they need. This copying produces some spelling mistakes, a G misprinted as a C. Many spelling mistakes do nothing; a sentence still makes sense even if one letter is wrong as seeen here. Occasionally typos can do a lot of damage, like printing “Tigers, None” as opposed to “Tigers, Nine” when trying to provide a warning about entering a dangerous area. Bacteria with these harmful typos die off. Some typos, however, are beneficial: “let them eat cakes” is better than “let them eat rakes”. It is possible that one of more typos will allow bacteria to survive an antibiotic. This is known as resistance. Other bacteria are killed by the antibiotic so only the resistant remain and grow quickly since the competition is removed. To make things worse, from our point of view, bacteria can share their resistance strategies. Bacteria can contain structures called plasmids. Plasmids are individual books containing, among other things, resistance recipes. Bacteria produce copies of these books and give them to each other, a natural form of peer to peer sharing. Resistance on plasmids can be spread from bacteria to bacteria so resistance does not have to be developed afresh each time, it can be borrowed. Resistance is an example of evolution. But how are bacteria evolving to deal with antibiotics so quickly, a mere ninety years since we started using them? “Antibiotic resistance is probably as old as the bacteria themselves.” states UCL’s Adam Roberts. Antibiotic resistant bacteria have been found trapped in 1000-year-old Incan mummies, imprisoned in 30,000 year old permafrost and in a New Mexico cave which had been isolated from the outside world for four million years. The reason for this is that the vast majority of our antibiotics were first produced by soil bacteria, or fungi, to kill of other bacteria. Bacteria which produce antibiotics themselves need to be resistant for their own protection. Once antibiotics are present in the environment any other resistant bacteria will gain a massive advantage. Anywhere bacteria are found there is likely to be antibiotics and resistance. Roberts swabbed the Naked Scientists’ offices and found two interesting bacterial species. One displayed resistance to four different types of antibiotics and another was producing an antibiotic that killed drug resistant E. coli. Antibiotic resistance is only useful if antibiotics are present. Absent antibiotics means that a bacterium is just wasting energy fighting what is not there. Resistance is evolved away when no longer useful, however in our modern world antibiotics are ever present. The world has been flooded with human produced antibiotics creating conditions in which resistance is always useful, and several practices are leading to higher levels of resistance. Antibiotics are prescribed to many of us when we’re ill. Ideally they wipe out non-resistant bacteria and any resistant bacteria are gobbled up by the immune system. Problems occur when people do not take antibiotics correctly. If treatment is stopped early, non-resistant bacteria remain and overwork the immune system allowing resistant individuals to slip through and cause future infections. Sometimes the wrong antibiotic is prescribed. Treating a bacterium with an antibiotic it is resistant to does not cure the infection and, therefore, boosts the total amount of antibiotic in circulation, increasing the pressure for resistance to occur. 80% of antibiotics sold in the United States are used on livestock. This is to increase growth since animals do not then devote energy to their immune systems. Antibiotics then enter the environment through animal urine. With the human population rising, along with our demand for cheap meat, this practice is only likely to increase. Human and animal use provides constant but low-dose exposure to antibiotics. If antibiotics were encountered only as acute high doses then bacteria would be killed before they could divide and produce resistance. Low doses mean that bacteria are not killed outright (only slowed) so resistance has time to evolve. Through our continued use of antibiotics, bacteria are fast becoming resistant to the full spectrum of chemical agents which humans have developed. New antibiotics, ones with no resistance, are hard to grow. In 2015 scientists from Northeastern University in the USA discovered the first new antibiotic for nearly 30 years. Making new antibiotics is extremely difficult. The first step is discovering the new antibiotic. To look for a new antibiotic, you first must grow the bacteria or mould you are interested in and see if it produces any antibiotic reaction. 99% of bacteria cannot be grown in the lab, we cannot (at present) replicate their natural environment. Before Teixobactin can be utilised in the clinic, it needs to go through rigorous clinical trials and its production scaled up to industrial levels. The Tufts Centre for the Study of Drug Development estimates the cost of making a new drug is $2.558 billion. For drug development to be economically viable the company developing that drug has to make a profit. This return is expected for cholesterol lowering drugs which are prescribed by doctors in large numbers. The is not true for new antibiotics. To prevent resistance any new antibiotic will become a medicine of last resort and only used for infections that are resistant to other antibiotics. It would take an astronomically long time for a pharmaceutical company to make their money back. It may be in the future that governments offer incentives to cover the cost of new drug manufacture since antibiotics do not fit the standard “big pharma” company policy. Whilst we wait for Teixobactin, it may be time for humans to use bacteria’s natural enemies against them. When you get infected by a virus the outcome is a cold. Bacteria can get colds too. Viruses which prey on bacteria are known as bacteriophages. A bacteriophage sticks to a target bacterium and injects its genetic material. This material instructs the bacteria to make more bacteriophages until they burst out killing the bacterium; the newly produced viruses repeat the process. University of Leicester’s Martha Clokie is using bacteriophages to treat the common hospital acquired infection Clostridium difficile (C. diff). Clokie has found a cocktail of four viruses which kill 90% of C. diff strains found in hospitals. What benefits do viruses have over antibiotics? “One is the fact that they’re so specific. If you’ve got that hospital superbug, C. diff, and I give you a set of viruses, I will just remove that one species, not the others” says Clokie. Antibiotics act like a fire bomb indiscriminately killing all bacteria (including good bacteria) which live in our stomachs. This is why you may have an upset stomach after ingesting antibiotics. Bacteriophages are sharp shooters and only eliminate one specific bacteria. Bacteriophages cannot infect humans. C. diff produces a thick sticky sheet known as a biofilm which antibiotics cannot penetrate protecting the bacteria. Bacteriophages pierce through this layer making C. diff more susceptible to antibiotics, allowing the use of antibiotics they were previously resistant to. How long until viruses are the cure? “I’m working with my collaborators at the University of Loughborough and we’ve shown that we can encapsulate these viruses into a pH-sensitive polymer so we can take them the same as you take an antibiotic.” explains Clokie. The pH-sensitive polymer is a capsule that allows the viruses to be taken as a pill and survive the acidic stomach. Using viruses to cure infections was used in the former Soviet Union. During the cold war Russian scientists were isolated from Western developments in antibiotics, so they developed alternative measures. In Georgia, bacteriophages are approved by the country’s health authorities. If viruses do not rush into save us how worried should we be? In 2014 the British government commissioned a review on antibiotic resistance. The report estimated that 700,000 people annually are dying due to infections caused by resistant bacteria. This number is set to rise to 10 million deaths a year by 2050 if steps are not taken. At present cancer kills 8.2 million people a year. The cost to the world from now until 2050 by antibiotics is estimated at $100 trillion. These statistics threaten a return to the dark ages by which patients can no longer be given antibiotics before surgery or cancer patients (whose immune systems are blitzed by treatment) can no longer rely on chemical protection. Antibiotic use must be controlled. Lord O’Neill, who chaired the review, has called on modern governments not to allow the prescription of antibiotics until the infection has been scanned for resistance, so that only the correct antibiotic is prescribed. There must be global agreement on the reduction of antibiotics in farming. Research into new antibiotics must be funded in a manner which is cost-effective. Research must also continue into alternative options such as bacteriophages and new vaccines which prevent us getting the initial infection, reducing antibiotic demand. Modern sewer systems reduced the death total from infectious diseases in the western world before antibiotics. Developing countries will need similar improvements in waste management to help curb deaths and prevent infections. Lastly, members of the general public can help by never demanding antibiotics for a cold, taking antibiotics as directed and by washing their hands when entering and exiting GP surgeries and hospitals. Antibiotic resistance is a real concern, one that if left unchecked could send humanity spiralling back to the middle ages. It is one, however, that is potentially solvable; if allocated the correct amount of time, resources and education. Only time will tell which direction humanity will take. Previous The obesity pandemic - an epigenetic time bomb? So long story short, if things don't change there will be a great dying caused buy our own intelligent stupidity. I don't take any meds for any thing unless I make it with my two hands. I don't get sick with the things all you people pass around. Almost as if I'm immune. I'm ready for an empty world!!! !